Downward-facing dog is the poster pose for yoga. Many people have heard of it, even if they do not know much about yoga. Many people also think it looks difficult or that they are not flexible enough to do it. It is not nearly as complicated as it may look! The pose can always be modified to suit your level of flexibility. 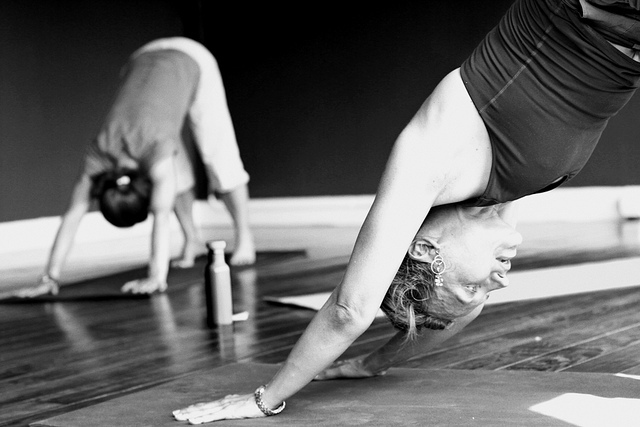 Here are 5 modifications and variations on the famous downward dog. Downward Dog on your Toes. This modification does not require much explanation — instead of reaching the heels towards the ground, you stay on your toes and focus on lengthening the spine by pressing into the hands and lifting the hips up and back. Downward Dog with Knees Bent. This modification just builds on downward dog on your toes. If your hamstrings still feel pulled to within an inch of their life when you are on your toes, bend your knees until you feel more comfortable and keep working on lengthening the spine. Three-legged Dog. This variation of the pose involves lifting one foot off of the ground and reaching straight back through the heel or lifting the leg a little higher, whatever you fancy! Try to keep your weight even between your hands as your perform the pose. If your hamstrings are screaming, come onto the toes of your standing leg and bend your knee. Psoas Stretching Dog. This is a more intense version of the three-legged dog pose. Here, you reach your leg up as high as you can, turning your hip to the side to lift the leg as high as possible. You can stay here reaching through the toes to feel a stretch on the front of the lifted leg or you can intensify the stretch further by bending your knee! Pivoting Downward Dog. This version of downward dog feels nice if you want to stretch out the sides of the body. From a downward dog, simply come onto the toes, pivot both feet to the left and bend the knees. To switch sides, just straighten the legs and come back to center before pivoting to the right. You can experiment with bending the knees deeply in this pose as well.